Serotonin: The Mediator That Spans Evolution provides a comprehensive review of the widespread roles for serotonin in respiratory, cardiovascular and thermoregulatory control, and for growth and development in early life. This important resource highlights serotonin’s role in normal (unstressed) conditions, and in response to a variety of physiological stressors. It focuses on new animal models, comparing and contrasting data from mice and rats. 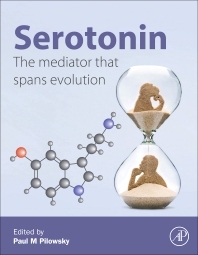 In addition, the book compares and contrasts the physiological effects of brain and blood serotonin systems and includes new data suggesting that the influence of serotonin is in part through the regulation of gene expression. Finally, it discusses the role of serotonin system dysfunction in a variety of pathophysiological conditions, including sleep apnea, obesity and hypertension, and presents compelling evidence that this dysfunction is involved in Sudden Infant Death Syndrome (SIDS). Paul M Pilowsky began his career as a graduate student investigating, inter alia, the role of brainstem and spinal cord pathways in the control of blood pressure with a focus on serotonin. His work has now been cited more than 5000 times and published in major Journals including the Journal of Neuroscience, the Journal of Comparative Neurology and the British Journal of Pharmacology. A hallmark of his work has been the adoption of, and combination of, novel approaches to address difficult questions. He pioneered the use of combining single cell electrophysiology in vivo with immunohistochemistry. His development of isotype selective monoclonal antibodies to phosphorylated tyrosine hydroxylase enabled the detection of tyrosine hydroxylase positive presympathetic neurons in the brainstem that had become excited. He was responsible for the initial development of a new medical school at Macquarie University in Sydney. His service to Neuroscience was recognised by the award of the Australian Neuroscience Medal. He mentored 26 graduate students to on-time completion, and mentored 24 post-Doctoral Fellows, many of whom now have their own established careers. In imagining this book, it was felt that a departure from the usual highly focussed text would be of interest. Hence, a multi-Author volume has been created that reveals the multiple facets of a neurotransmitter with very broad actions.